This article shows the differences between the Arduino Uno and the Arduino Uno revision 2 and revision 3 boards. Three different boards are referred to in this article: The original Arduino Uno board, Arduino Uno revision 2 and Arduino Uno revision 3. On the Arduino Uno revision 2 board, the ATMEGA8U2 is positioned at 45 degrees. This is changed back to square position on the revision 3 board. Both revision 2 and 3 boards add four solder pads (JP2) connecting to pins PB4 to PB7 of the USB ATMEGA. 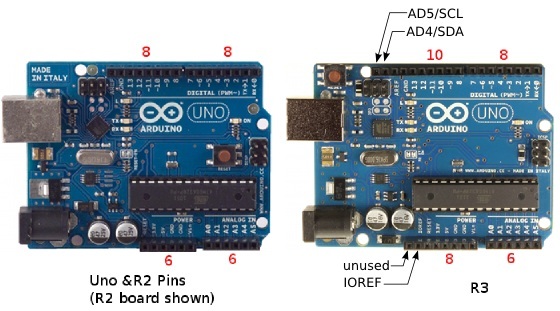 The Arduino Uno and Arduino Uno revision 2 both have an ATMEGA8U2 USB microcontroller on board – this is upgraded to an ATMEGA16U2 on the revision 3 board. 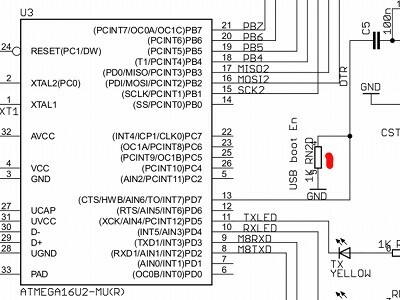 Revision 3 adds a diode across the USB ATMEGA reset pin pull-up resistor. Revision 2 and 3 boards are both supplied with header pins in the USB ATMEGA ICSP header rather than just solder pads in the Arduino Uno. Both revision 2 and 3 boards add a 1k pull-down resistor to the DTR (HWB) line coming from the USB ATMEGA microcontroller – from the PD7 pin. 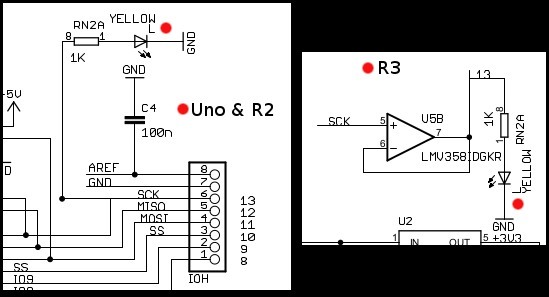 The Arduino Uno and Arduino Uno revision 2 both have a LED and resistor connected in series on Arduino pin 13. The revision 3 board buffers this LED/resistor through a unity gain op-amp. This is the spare op-amp that was unused on previous boards. The revision 3 board changes the 8 pin connector that contains Arduino pins 8 to 13, GND and AREF for a 10 pin connector. The extra 2 pins are connected to AD4/SDA and AD5/SCL. These are the two analog input pins that can be used for I2C. These pins are still connected in their usual position on the revision 3 board, but are connected to the two extra pins on the 10 pin header as well. Revision 3 boards also change the 6 pin connector that has the reset pin connected to it to an 8 pin connector. 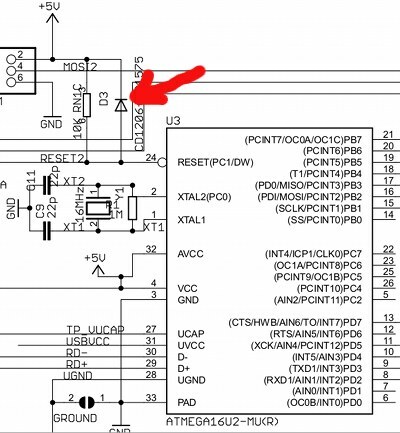 One of the new pins on this header is the IOREF pin that allows shields connected to the board to adapt to the voltage of the board. The second pin is not connected and reserved for future use. The revision 3 board adds a diode across the ATMEGA328P microcontroller reset pin pull-up resistor. 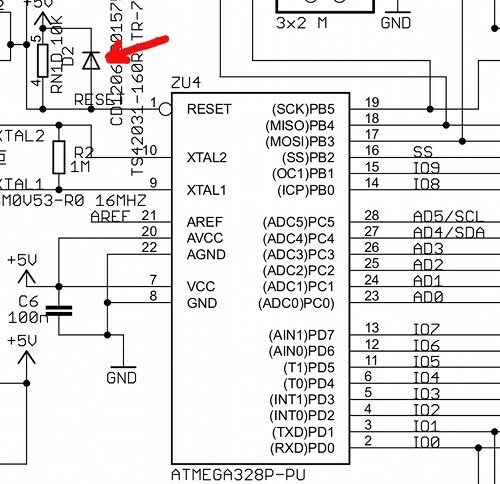 The revision 3 board moves the ATMEGA328 reset push-button switch from behind the ICSP header and places it next to the USB connector (see the first image at the top of the page).